Guyana’s Ministry of Natural Resources Monday night announced that it is seeking a legal opinion on whether Junior Minister, Simona Broomes’ appointment can potentially lead to a conflict with her material interest in the mining sector. “The Ministry has solicited a legal opinion on the matter of conflict of interest and will pronounce with greater specificity on this issue very shortly,” said the ministry in a statement. The Ministry used the opportunity to blaze People’s Progressive Party (PPP) General Secretary, Clement Rohee for attacking Broomes’ integrity and citing a possible conflict of interest between her and Pharsalus, a mining company wholly owned by the Australia-headquartered Troy Resources. President Granger has said that he was unaware of Broomes’ relationship with the mining company. ““I am not aware of her involvement in Troy Resources. I knew that she has a mining background and we felt that that would be an asset because of what she is likely to be involved in at the Ministry of Natural resources would be the protection of our working people,” he said. Even as the Ministry awaits the legal opinion, it reiterated its confidence in Broomes who has been assigned responsibility for occupational safety and health, and other welfare issues in the mining sector. “The Ministry of Natural Resources wishes to state categorically that the shenanigans of the PPP will do nothing to diminish its confidence, and for that matter, the confidence of the Government of Guyana in the Honourable Minister,” said the ministry. While in government from 1992 to 2015, the PPP had been repeatedly accused by the then opposition of racial discrimination, corruption, nepotism, human rights abuses, turning a blind eye to narco-traffickers and drug smuggling and other forms of alleged mismanagement. Since coming to power eight months ago, the coalition has been conducting several forensic audits at agencies like the National Industrial and Commercial Investments Limited (NICIL) and the Guyana Revenue Authority (GRA). Broomes has publicly acknowledged that she has three mining properties in the Issano area and that she has an agreement with Pharsalus for several years. The Junior Minister has said that she does not see her agreement with Pharsalus being a conflict of interest. And Senior Minister, Raphael Trotman has assured that he would be dealing with any matters concerning any interest or relationship that Broomes has in the mining sector. 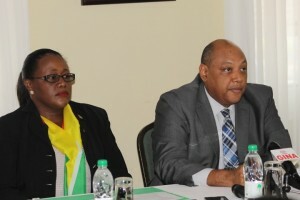 Transparency Institute of Guyana Inc. has said that the Junior Natural Resources Minister should relinquish any interests she has to avoid real or apparent perceptions of conflict of interest. A Troy Resources document seen by Demerara Waves Online News states that the company has the option of acquiring a 100 percent interest in three medium scale prospecting permits in keeping with an agreement signed in June, 2012. So far, she has been paid US$40,000 on the signing of the agreement, and two more payments of US$40,000 each. Pharsalus Gold, according to the document, enjoys full rights to occupy, explore, prospect, mine or carry out related activities on the tenements. The document also states that after the exercise of the option the vendor, Simona Broomes is entitled to a 2% Net Smelter Royalty, which Pharsalus has the option to purchase at any time for a cash payment of US$1,500,000.